This Leah4sci tutorial video shows you how to name molecules containing a carbonyl in the middle of the chain using my puzzle piece approach to IUPAC nomenclature. Naming examples include simple and substituted ketones, multiple carbonyls and cyclic ketones. 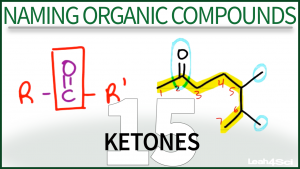 This is Video 15 in the Naming Organic Compounds Video Series. Click HERE for the entire series.